11 trends for 2010, and it appears home owners are turning toward traditional styles with a focus on energy efficiency. Many households will stick with tile covering the floors, but hardwood in kitchens is expected to increase in 2010. Granite is still top choice for counter tops, but NKBA expects quartz to rise in use. 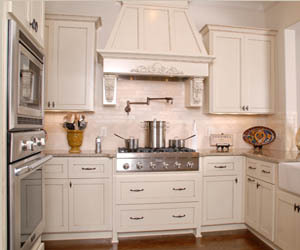 The color scheme of kitchens will drift to more natural colors, with white and off-white becoming extremely popular. Cabinetry will either be white (in the style of Food Network celebrity kitchens), or beautifully stained to enhance the wood underneath. Sometimes a standard faucet just can’t get the job done. Pull-out faucets as well as pot-filler faucets will continue to gain popularity in 2010. These faucets will have brushed finishes or be polished chrome. To improve energy efficiency, dishwasher drawers (which have multiple compartments to wash small loads if needed) and induction cooking units are becoming more popular, though gas cooking is still at the top. Basically, these toned down kitchens have a muted color palette, but quality materials are still key. Following the same lines of the kitchen, the bathroom will return to a more traditional style. Sinks, tubs, and toilets will all be the traditional white. Faucets, handles, and lighting will either have brushed nickle or polished chrome finishes. Unlike the kitchen, hardwood will not have a place in the bathroom this year. Granite however, remains popular for vanity tops. If you plan to move or remodel, keep these design tips in mind. This year’s traditional trends prove that contemporary design is momentarily fun, but traditional has lasting value and appeal.